Pea (Lat. pisum; Celt, pis; Fr. pois), a common name for the fruit and plant of pisum sativum, and with a qualifying adjective for numerous related plants of the leguminosce or pulse family. Pease, as a plural form, to express quantity or species, is much more in use in England than with us; the older English writers wrote the plural peason, to agree with housen, hosen, etc. The garden pea is a smooth and glaucous annual, from six inches to as many feet high, with abruptly pinnate leaves, of usually two pairs of leaflets, and the common petiole terminated by a branching tendril; at the base of the leaf is a pair of conspicuous stipules; peduncles axillary, and bearing one, two, or more white or pale violet flowers, having the irregular form common to a large portion of this family, and known as papilionaceous. 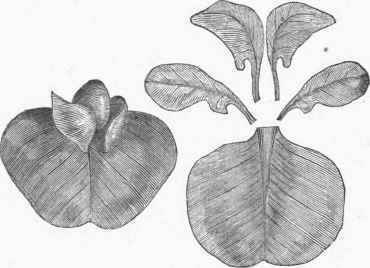 The calyx has leafy lobes, and the five petals, unlike in size and in shape, have received fanciful names; the upper and larger petal is the standard (vexillum), the two side petals, immediately below this, are the wings (alee), and the two lower ones, usually coherent by their edges, form the keel (carina); the stamens are ten in number in two sets (diadelphous), nine being united by their filaments for the greater part of their length, forming an incomplete tube, while one stamen, the uppermost, is entirely free; ovary one-celled, terminated by a rigid style, flattened laterally and bearded down the inner edge; pod somewhat fleshy, several-seeded; the seeds globose, with very thick cotyledons which remain underground in germination. Our garden pea was cultivated by the ancient Greeks and Romans, but there is no proof that it was known in early times to the Egyptians; some regard it as a descendant of the wild field pea (P. arvense) of southern Europe, hut De Candolle is disposed to admit it as distinct, it having been found wild in the Crimea by a single collector; peas have been found in the Swiss lake dwellings, hut they are regarded as some variety, now extinct, related to the field pea. The introduction of the pea into England is supposed to have been by the way of Holland or France in the time of Henry VIII. Probably none of our garden vegetables present so many varieties as the pea, though careful experiments show that many of the named kinds are so like one another as to be undistinguishable; our seedsmen offer from 20 to 40 varieties, and the lists in the English catalogues are still larger. As peas are generally self-fertilized, the structure of the flower being such that crossing cannot occur without the aid of insects, which seldom take the trouble to get at the stamens, the well established varieties come very true to their kind many years in succession; still there are occasional spontaneous variations by seed, which growers take advantage of, and produce some of their new kinds from them by selection, while other varieties are obtained by careful cross fertilization. There are two very distinct classes of peas: the common pea, the best known and by far the largest class, of which the unripe seeds only are eaten, and the eatable-podded, also called sugar, skinless, and string peas, in which the pods have not the tough parchment-like lining present in those of the common kind, but are tender and succulent. In the latter the pods are larger than in the former, and are used in the green state in the same manner as snap or string beans, the young pod being cooked with the seed; there are but few varieties of this class, and they have not attained the place in our gardens which they hold in those of Europe. The common garden peas are of two kinds, one with the seeds, whether young or ripe, quite spherical and smooth, and when ripe yellowish white; the other, known as the wrinkled or marrow pea, have even when ripe a wrinkled surface, and when mature retain more or less of a greenish shade; they are usually much larger than the round peas, and are flattened at the sides by mutual pressure in the pods. These two kinds are still further subdivided into dwarfs, which are from 6 to 18 in. high and need no support, and tall kinds which grow from 2 to 6 ft. high and require brush or other support. All varieties of the round pea are traceable to one called Hotspur with various prefixes, known as long ago as 1670, of which numerous sub-varieties or " strains " have been in cultivation ever since; among the names which this and its progeny have borne are Charlton, early Kent, and early Frame; the present well known Dan O'Rourke is a form of this; it grows from 3 1/2 to 4 ft. high, and under one of its many names is more largely cultivated than any other. The most prominent dwarf variety of the round peas is Tom Thumb, which rarely exceeds 9 in. in height, but produces abundantly for the size of the plant, and its pods are fit to pick nearly all at once. Among the wrinkled peas the most universally popular is the Champion of England, a strong-growing variety, 5 to 6 ft. high, with pods 3 1/2 in. long, closely crowded with large peas of the highest excellence. McLean's Little Gem is a dwarf variety of the class of wrinkled peas, not exceeding a foot in height, and excellent in quality. These four are representative varieties in their classes, and the kinds with which all related varieties are compared. Probably no vegetable differs more in quality than this, owing to variety, degree of maturity, and length of time it has been gathered. The wrinkled varieties are much sweeter and better flavored than the round, but on account of the greater earliness of the round, the first peas of the season are always of those kinds; an experienced person can tell by feeling of the pods when they are in proper condition to pick for the table; if too young, the nutritive matter in the seeds is very small in proportion to the envelope or hull, while too great maturity is accompanied by firmness and lack of flavor. Hot and dry weather is very unfavorable to the pea, and the crop is never in this country so satisfactory as in the moister climate of England. - The best soil for peas is a strong clayey loam with abundant vegetable manure; stimulating fertilizers are not needed. In gardens it is customary to sow peas on land that was heavily manured the previous year for some other crop. In market gardens they are sown in rows 5 or 6 ft. apart and the vines allowed to fall down; to prevent injury they are turned over every few days. In private gardens it is usual to sow two rows, a foot Or less apart, and when well up to set brush between the rows for the vines to run upon. The dwarf kinds are sown in rows a foot or more apart, and need no brush. The cultivation of peas as a field crop, so common in Europe, is increasing in this country. They are sown broadcast and ploughed under or drilled, in; they are often sown together with oats, the two being harvested, threshed, and fed together. Peas are very nutritious for animals, and are especially used for sheep and swine; the haulm, or vine, is an excellent sheep fodder. The field variety generally planted in this country is the black-eyed. Peas contain a large amount of flesh-forming principles; analysis shows 22.4 parts of albuminoids and 53.3 of carbohydrates in 100. In the ripe state they form a very nourishing food for man, as well as for domestic animals; in Scotland pea meal is made into thick cakes called pea bannocks, and in the form of split peas, deprived of their skins by machinery, they are largely used to form the nutritious pea soup and pease pudding. In the late war with France the German troops were supplied with rations in the form of a sausage, of which pea meal formed a large part, mixed with fat, meat, and condiments. - The enemies of the pea are mildew and the pea weevil. The mildew, a fungous growth, is best avoided by early and deep sowing; hot weather favors its development. The weevil is a small beetle, oruchus pisi, which lays its eggs upon the very young pod; the grub as soon as hatched eats its way through the pod to the young pea; the wounds heal up after it, though a scar may be formed, and the grub, only one in each seed, grows at the expense of the substance of the pea; completing its growth by the time the pea is ripe, it cuts a hole for its future escape, as far as the skin of the seed, and then enters the pupa state; some may come out as perfect insects in the autumn, but the majority remain dormant till spring. The embryo being avoided by the insect, infested peas will germinate; but as the young plants are thus deprived of their proper amount of nourishment, the grub having appropriated it, such vines are feeble and unproductive. The pea bug is not known in some localities, and dealers have their seed raised in these places. It is said that the vapor of turpentine will kill the insect, and chloroform has been used for the same purpose, as has scalding. - The cow pea of the southern states is largely cultivated as a forage plant, and it is'of the greatest importance in southern agriculture; this, in the appearance of its seeds, is more like a bean than a pea; it is a species of dolichos (vigna of some authors), so modified by long cultivation that its species is difficult, to determine; the writer has a collection of 23 varieties, differing as much in size, color, and markings as those of the garden bean. - The chick pea is cicer arietinum, a native of India and southern Europe; it is an erect, branching, hairy annual, with pinnate leaves of six to nine pairs of leaflets, mostly solitary pea-like flowers on long peduncles, and a hairy bladdery pod containing two or three large wrinkled seeds; the surface of these is so irregular as to present somewhat the shape of a ram's head, whence the specific name arietinum. The glandular hairs of the plant exude oxalic acid, which sometimes in dry weather appears in minute crystals. This pea, extensively cultivated in the East and in Mexico and South America, is but little known in our gardens; in the countries named it is much eaten, ground into meal and made into cakes, or in soup; the French use it as the basis of a favorite soup, puree aux croutons; it is more indigestible than the common pea. In India this pea is known as gram, in Spanish countries as garoanzo, and in this country to some extent as coffee pea, as several years ago the seeds were sold at an exorbitant price as a perfect substitute for coffee. - The everlasting or perennial pea is lathyrus latifolius, a desirable trailing garden plant, producing a profusion of clusters of pink, purplish, or white flowers. The Japan pea, at present widely advertised as a most valuable plant for its seeds and fodder for the southern states, is a species of soya, very near the soy pea, S. hispida, if not a form of it. Beach pea, lathyrus maritimus, found on the seacoast from New Jersey northward, and on the shores of the great lakes, is also a native of Europe; it has large purple flowers, and'is a noticeable wild plant. The sweet pea, a favorite garden annual, is lathyrus odoratus, the charming fragrance of which is recognized in its botanical as well as its garden name; it is a native of Sicily, and is in general cultivation. The vine resembles that of the common pea, but is hairy, and produces its flowers two or three together on a long peduncle; the seeds are small and nearly black; the flowers in the original state have a rose-colored upper petal or standard, and the rest white. By cultivation numerous varieties have been produced, and the named sorts give pure white, blush, blue, scarlet, and various purples, one of which is so dark that it is called black. The vines, which in good soil grow 5 ft. high, must have a support of some kind to which to cling. In the cultivation of this flower two points are essential to the best results, to sow very early, and to not allow the vines to be exhausted by the production of seeds. Pea (Pisum sativum) - Leaves, Flowers, and Fruit. Pea Flower, entire and dissected, showing the standard, two wings, and the lower petals forming the keel.